This article describes the settings for one sold by NYplatform on eBay (about $25 for 5 inc post at the time of writing – but they are getting cheaper). It uses the Philips PCF8574T I2C expander chip which is supported by the user developed Arduino LCD Library V1.2. In testing RC electric drive systems (ESC + BLDC motor), a repeatable scenario was needed to evaluate changes such as changes to commutation advance. Often these changes have different impact under rapid acceleration or deceleration to slower changes. 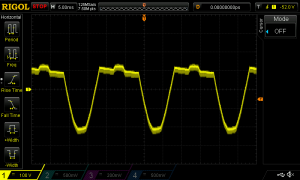 This article describes a simple servo signal ramp generator based on Arduino hardware, in this case using an Arduino Nano but most Arduinos or clones could be used or adapted. The Hobbyking A30 is an economical power supply for LiPo chargers. 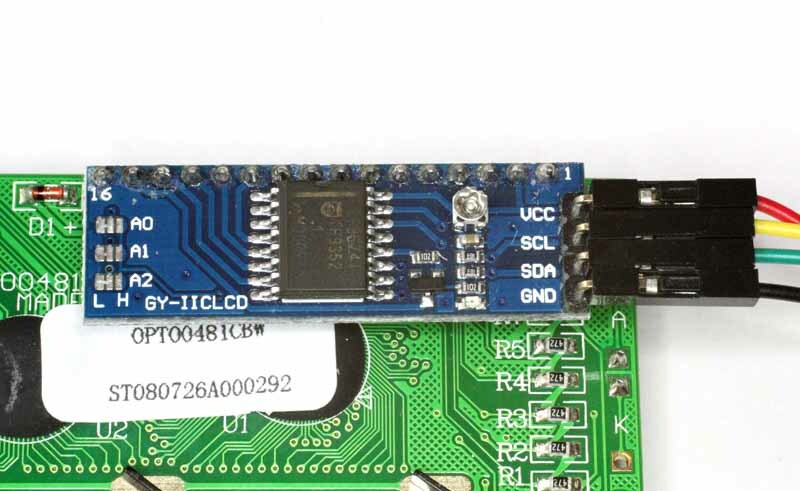 problems were noticed with a Turnigy Accel 8150 charger where the display became corrupted when the case was touched. It turned out the output terminals of the A30 are isolated from chassis and power supply ground. 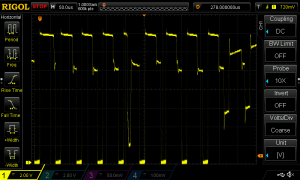 Above is a scope capture of the voltage to chassis on the -ve output terminal, a common mode voltage of almost 300Vpk. 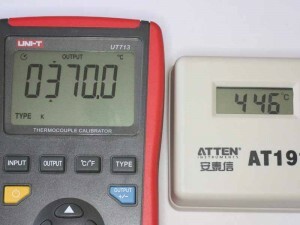 Sure, it will not sustain much current, but it is potentially (pardon the pun) dangerous to any electronic equipment connected to the power supply. In my case, I dismantled the case and bonded the -ve output terminals to the mains connector earth terminal with a 2.5mm^2 insulated wire. Whilst performing that work, I was concerned at the proximity of a large toroidal choke and the top cover with no intervening insulation. I applied some kapton tape to the lid to reduce the risk of problems. Oh, and the power supply rattled when received. That was an extra case screw loose inside the power supply, and it had fortunately not yet caused apparent damage. These power supplies are not intended as a general power supply for electronic equipment, and they do make a lot of radio frequency interference (RFI). SAFETY WARNING: do not remove the covers or attempt such a modification unless you are competent to do so. A sensorless brushless DC motor senses motor position for the purpose of commutation timing by using the voltage induced in the unused winding at the time. Reliably sensing the motor position for a range of motor constructions and speeds proves a challenge. 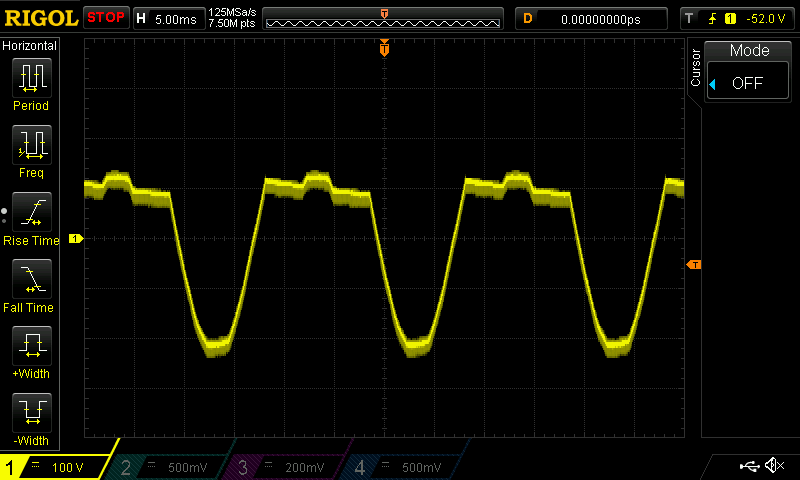 Above is a capture of the waveform during two commutation steps where this FET is low side modulated. 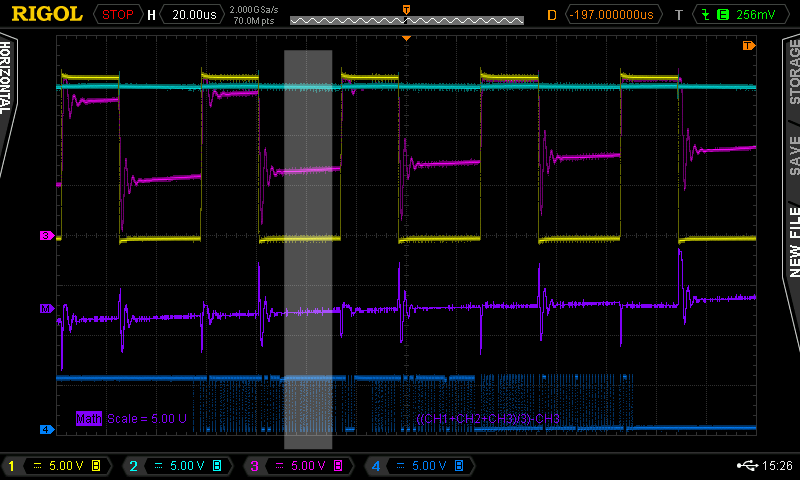 You can see that when the low side FET turns off, voltage rapidly rises to just above battery as the energy stored in the winding inductance drives current through the high side FET body diode (which drops 0.7+V) and the other high side FET that is on. In an attempt to fix up a government orchestrated flawed regulatory and market environment that saw the dominant carrier digging its heels in to regain the right to install infrastructure that it was not required to share with competitors (ie, to allow it to reestablish a monopoly), the Labour government called for tenders from organisations to provide a National Broadband Network on its terms. No contracts were awarded, government decided the way forward was for it to own the access network, at least for the interim, and so return to the situation that existed prior to the partial privatisation of Telstra in 1997. 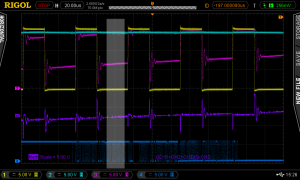 This article describes measurement of an Icom IC-7000 current consumption during SSB telephony transmission. 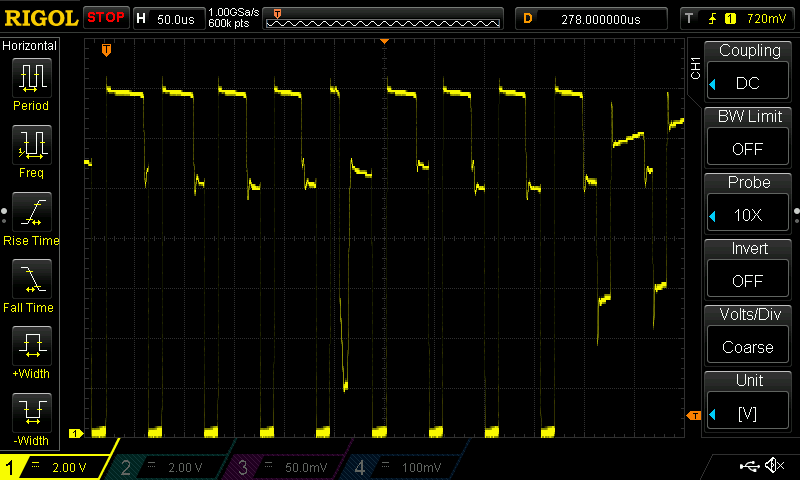 The capture is of an IC7000 running 100W PEP with compression off. I have read copy as loudly and consistently as I could with barely a breath, so it is an overestimate of current consumption. There was small ALC deflection, but not so much as to effectively provide compression. Compression will draw higher current, depending on the level of compression. Note too, that like many Icom radios, the IC7000 draws a relatively high current key down with no audio (4.5A here). 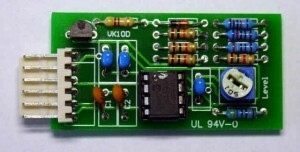 With the forced end of the VK1OD.net website, some builders of the Roger Beep kit may be without documentation. I purchased an Atten 191 soldering iron thermometer which uses K thermocouple elements from Allendale UK. With the closure of VK1OD.net as a consequence of an enforced change of call sign, a monument to the growing emphasis on train spotting in ham radio, owenduffy.net is being reorganised. It will essentially be a blog site with a mainly electronics focus, but less ham radio focussed than was vk1od.net. Articles will be shorter, and expose less proof / derivation / evidence to better meet the needs of modern people who I am told just don’t have time for all that stuff. Some meatier topics will appear as a series of bite size articles to better fit the concentration span of modern readers. Nevertheless, there will be some citations, but I will keep them to a minimum. Excuse the large extent of self citation. It is not done for self promotion, but to acknowledge that some material is based on earlier work, some of which may be offline… and to remind me of where to look if I need to follow-up comments on the article.